The information provided on Climber's Paradise is helpful. However, it cannot replace preceding planning, personal responsibility and experience in outdoor sports and with your personal climbing equipment. The operators of the website assume no liability. All athletes climb at their own risk and are responsible for their own safety: There is always a remaining risk when climbing. Climbing requires experience dealing with climbing equipment, as well as with the different rope, belaying and climbing techniques. Distractions or mistakes increase the risk of injuring yourself or others. When climbing, one is also exposed to alpine dangers such as falling rocks or ice, thunderstorms or sudden falls in temperatures. Particularly the danger of falling rocks should not be underestimated in the alps whereby the stones can be of various seize or numbers. To ensure the security of the individual, e.g. wearing a climbing helmet as part of the climbing equipment is mandatory. 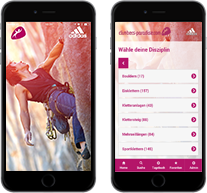 We refer to the climbing rules and safety aspects of the Austrian Alpine Club ÖAV. Only use standartised alpine sports equipment (CE-sign) & study its instruction manual. Warming up by doing gymnastics and easy climbing protects your joints, muscles and tendoms. The partner check is a mutual checking between climber and belayer before starting each climb. The following areas should be checked: safety knot (e.g. figure of eight), harness, belaying device, screw-lock carabiner, rope end. The life of your partner lies in your hands. Good communication prevents misunderstandings. Always inform your belay partner before you sit back on the rope and make a break from climbing. Abseil only using anchors made out of metal. Never use rusty or broken anchors and never use two ropes in the same carabiner. A helmet protects your head from head or brain injuries when falling or rockfalls. Respect other climbers and let them know about occuring mistakes and dangers. Follow signs and any probihibitions in each of the climbing areas!